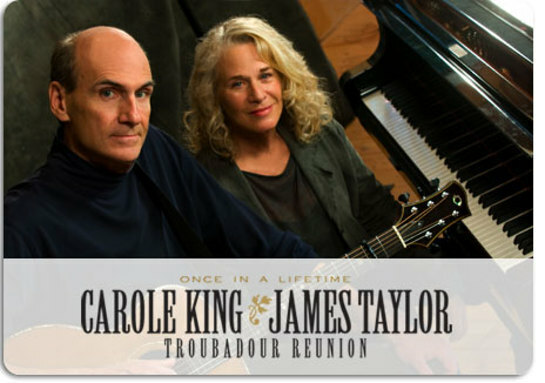 In conjunction with Tickets-for-Charity, James Taylor and Carole King are offering fans one-of-a-kind VIP Stage Seat Charity Packages to their long-awaited Troubadour Reunion Tour, including the very best seats in the house, to benefit the Natural Resources Defense Council, the Alliance for the Wild Rockies and other outstanding charitable causes. Charity Packages include unique Stage Seating arranged in tables of two around the stage, designed especially for the Tour to recreate the intimacy of the duo’s legendary performances at LA’s Troubadour. Available exclusively on www.ticketsforcharity.com, Charity Packages offer fans the concert experience of a lifetime while honoring the life-long environmental work of both Artists. Fans can now visit www.ticketsforcharity.com or call Tickets-for-Charity at 1-866-567-4576 to purchase VIP Stage Seat Charity Packages for tour dates nationwide! U.S. tour dates kick off on May 7 with a performance in Portland, OR and continue across the country through early July.